Retirement would be too boring for someone like Dr. Robert Wetzler. His career covered chiropractic care, Ob-gyn and general practice. Not to mention being the backstage doctor at Alpine Valley and having opened his home to his famous “patients” like the Grateful Dead. Helping to put a group together to open the Riverwest Clinic, 826 E. Center St., was a logical step. “You got my Murray’s?” inquires a man after making his way up the four concrete steps into a corner grocery store. He has a characteristic, free-spirited East side look — spiked, blondish/brown hair, a Navy blue jacket with Vitucci’s sprawled in white across its back, weathered blue jeans and black leather boots. He becomes visibly elated when the answer from the store clerk is an emphatic “yes.” It isn’t every day that an average white guy wantonly buys and smooths on Murray’s wave pomade — traditionally used by young black men to create mind boggling patterns in their hair. But Raymond Strickland, a local Riverwest tattoo artist, isn’t your average white guy. And Sunrise Foods isn’t your average corner grocery store. 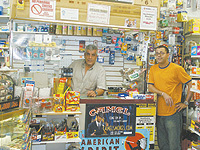 Fourteen years ago, Palestinian native Mike Salem dreamed of owning a business. He left his home in the old city of Jerusalem to actualize his dream. Living under occupation was just not for him. Two years after he made the 6,194-mile trip to Wisconsin, he began to watch his dream shift into something real. Today, he makes his living in an environment that in some special ways he finds refreshingly similar to his hometown. “My home was a sacred, holy place. Different kinds of people came there from all over the world. Over here (Riverwest) it is the same. Life is better,” Salem affirmed. Sunrise Foods, 2897 N. Weil St., is part of what has made life better for Salem. The other part is the people, his customers — like Strickland. They are drawn to many things about the store, primarily its homey feel, amiable workers and a myriad of products you need, and some you didn’t know you needed. The small airy, well-lit store rests in a historic 1883 Locust Street building and is stuffed full of things you’d expect in a corner grocery store, like foodstuffs, cigarettes, aluminum foil and cat food. There are also surprises like Belgian Wheat Ale and wide array of imported beer stored in a cooler marked “MILK.” “I have asked and asked for a new sign,” Salem says to the delivery man stocking a new shipment of the hop-filled beverage. First aid remedies, hats, scarves, brooms, lanterns, condoms, hair products, ice melting concoctions, Captain Black Tobacco, glue sticks for a glue gun, Rosa Fudge, toys, and silverware are all on display. The inventory doesn’t end there. “You can find anything here,” Salem beamed. “The store is supposed to be convenient. You can even send money and cash your check here too,” he added. Residents like Strickland agree. He has lived in the area for nearly seven years and normally shops by the seat of his pants for what he needs, when he needs it. But his needs nearly always lead him to Sunrise. “Those guys go way above and beyond the call of duty. They have a cool honor system when they know and trust you. They are really stand up guys,” he said of Salem and his staff of four. Though Salem, his wife and two young children didn’t move to Riverwest upon their arrival, it is evident that he values the area and its habitants. He readily explains why. “I am here every day, even with snow storms, by 8:15 am. I love this neighborhood. Where I live, in the suburbs here, there are only big stores and nobody knows nobody,” he lamented. Salem knows many of his customers by first name. Genuine niceties are exchanged along with the merchandise. One customer desperately needed to get a 4-roll pack of tissue, but didn’t want to get out of line. Rightfully so, as the steady line of customers in never seemed to dwindle, though people waited patiently and were generally in and out. The desperate customer asked Salem for special consideration, and he obliged, “Brett Favreing” the package over the heads of the people in line. The customer caught the package, paid for it and left the store, surely making his winning touchdown in the privacy of his own home. The atmosphere of Sunrise is relaxed and informal like that, on purpose. Salem believes that the mixture of people in the neighborhood are the defining pieces of the dream of a man whose own cultural background adds an unexpected flavor to the already “seasoned pot of greens,” that make up the Riverwest.